of sights, we had hopes of seeing it in a different way. i think we succeeded! this gave us a much more unique and personal experience on the volcano. the adventure galloping up steep volcanic trenches and back down in the dark! 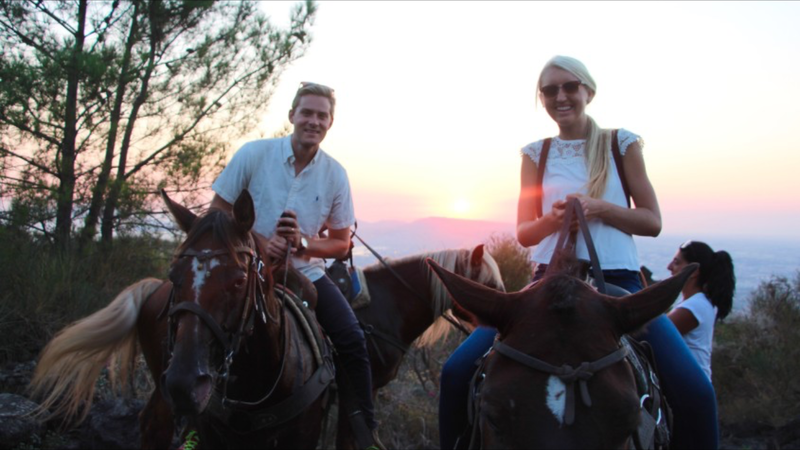 we went with horse riding tour, naples and loved every second. first, we recommend the sunset tour for sure. it’s less hot & more scenic. descend the mountain in almost complete darkness – which is fun, but scary! up to the vesevo stables up on the side of the volcano. such a great combination that i never expected to experience! we got to know some of the horses, then saddled up! for me when we started galloping – such a nice guy! both so happy and giddy at what we were experiencing. this is one of those once-in-a-lifetime bucket list items! ^^ the entire way up was so beautiful, lava rocks and all. ^^ i could only take selfies of us on the horse, sorry not sorry! it was amazing (and a little bit scary) to think that we were right on vesuvius itself. 30 times (!!!) with the next big one pending for this active volcano. that sunset, i tell you, was one of my favorites i’ve ever experienced. down the mountain which was the most adventurous part of all. like we were true italian cowboys & girls … haha! such an adventure. i even got hit in the face and lost my sunglasses on the trail, oops! rides so they aren’t over-riden, which was nice to hear. and such a major highlight of our summer travels. *you can find more info and book HERE! we got back to naples late at night, and walked to get dinner in the happiest mood. and will post soon! i can’t wait to share more from naples next!